This is Sophea Isabella’s favourite food so far.. Do you know how I know that ? Easy.. no war involves during meal time. Hahha.. She just simply open her mouth every time I shoved her the spoon.. Hahhaha.. Jamin sedap!! It’s very easy to do.. Siap in less than 30 mins.. First, you heat oil in the pan.. I use cooking olive oil for B’s food.. It contains necessary omega stuff (and that is omega 3 and 6) for her brain development. Than add the onion chopped apple and carrot.. Fry for about 4-5minutes. 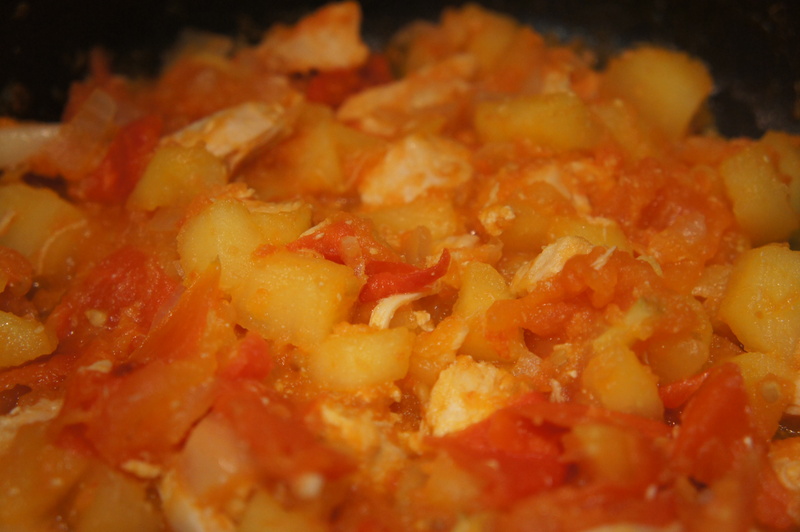 Then you add diced chicken, garlic and tomatoes. Fry until the chicken looks sealed. Then add chicken stock and tomato puree.. I suggest not too much of tomato puree because nanti masam sangat.. From my experience, nanti byk pulak poo-poo baby 😀 Maybe about 1-2 tablespoon should be enough..
Kacau, kacau, kacau and kacau.. bring to the boil and simmer for about 10 minutes until the chicken is cooked and it looks slightly dry like the pic above..
Then I blend the whole thing but since B is reaching 8 month already, I wanna introduce different food texture to her, so I don’t blend it to smooth like a total puree anymore. Now her foods are slightly lumpy so she will learn how to chew. Nom! Nom! Nom! Posted on March 17, 2012 December 2, 2012 by Dr Halina Mohd YunosPosted in MommyhoodTagged recipe, solids. Previous Previous post: Life as a Medical Student..
wahhhh, boleh cuba resepi ni utk baby saya…mesti yummy!!! Bawang and garlic nak letak berapa banyak? Kalau bleh bg the amount nk letak for each ingredient lagi bagus.. Heheh.. If x keberatan lah..
May I know how u made the chicken stock? Or if u bought it readymade, where can I get it? Thanks. I buat sindri.. Ayam buleh rebus dulu.. Air yg terhasil tu chicken stock lar..
Doc,serve dgn cooked fusilli pasta pun bestkan.Ada jual oragnic alpahabet pasta kat organic store.Stock ayam Dr buar sendiri ke? One more question, do you follow the 4 day rule when introducing new food? What are ur views on that? organic virgin olive oil tu ditambah lagi sebelum beri pade baby ye? maksud saye, masak gune olive oil then sebelum suap pun letak jugak ye? Tunggu 7 month niza.. Sbb ni protein. 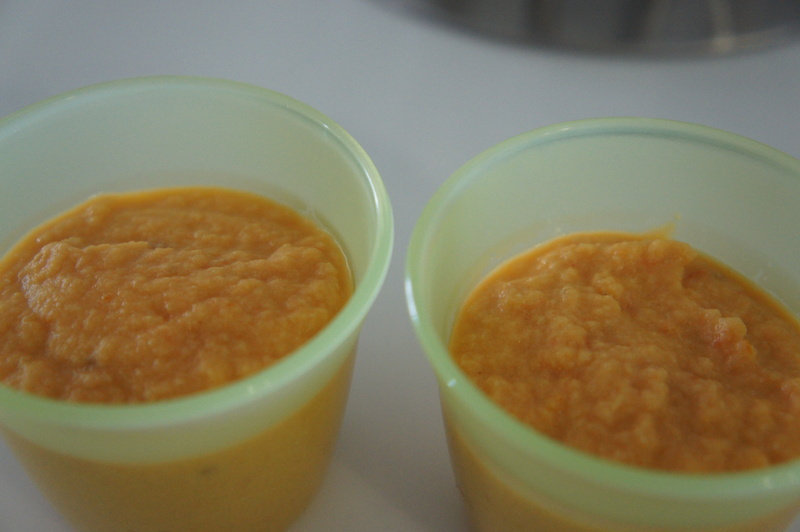 You shud try carrot puree, sweet potato mixed with broccoli or spinach dulu utk 6 month.. Buleh buat apple puree, pear puree jugak..
Dr share banyak2 baby’s food..suka sgt baca,,tak sabar nak tunggu baby keluar n prefer for her/him nanti..
am sooo making this one when my daughter reach 7 months. yayy! Hi dear, just wanna share that I’ve tried your recipe and my 8-month old boy loves it! I tukar2 sikit ingredients dia (depending what I have in my fridge) but still thanks for the idea and inspiration. Nanti share lagi recipe baru k? I wanna try fish but I have no idea nak masak camne. Have you tried fish dengan Bella? Buat sindri Fina.. Air rebusan ayam jer chicken stock tu sbnrnyer..
Orait tq. My baby baru masuk 7bln. Sy da blh start bg mkn goreng2 ni kan doc. Be4 ni steam blend je. Tq. Nnti blh post lg recipe baby…will feedback lps try :)))). Wah! walau pun with yur tight schedule ada masa buat food for yur lovely baby….salute! Cuteeeeee jer sampai bila bila baby bella ni .. Pakai PRL haihhhh .. Geramm! look yummy!! i just start weaning my 6 y.o baby…cant wait to introduce her fish& meat next month! I need ur favour, my daughter is 5 months old, what is the best food for her to increase her weight? Hi doc..this one leh buat frozen stock x?hihi.can tahan how many days eh? Buleh.. I only use mine max 4-5 days..
saya nk tnya, brand apa organic olive oill y doc gna 2 yer? thats tommee tippee.. i serve in a bowl, preheat dlm microwave jer..
Hi doc, this one bagi mcm tu je ker or serve with rice porridge? salam Dr.. the food look so yummy.. i’ve been thinking to prepare for my 9months old baby.. but is garlic ok with baby?? hi doc..yg organic olive oil tuh dr masak n renjis dkat puree gune minyak yg same?? Salam dr, anak saya berusia 6 bulan lebih adakah sesuai untuk diberi mkn puree ayam ini? salam yati, rasenye protein mcm ayam ikan daging ni sesuai utk 7bulan ke atas. utk permulaan solid kpada baby 6bulan, try buah2an atau bubur nasi+sayuran dlu. blend hancur. hello dr halina, sy try resipi ni last satruday. anak saya suka! saya blend jadi puree utk anak yg 9 bulan. anak 2 tahun mkn dengan pasta sebagai gravy. sedap! saya paksa abahnya try jugak sbb sedap sgt. hehe. btw, saya tak letak tomato sbb anak 9bulan belom penah mkn tomato lagi. later nak buat lagi buh tomato plak.